Australian surfing team clinched the overall gold medal during the ISA China Cup ending on Sunday here in Wanning city of China’s Hainan Province. Brazil and Hawaii from USA got the silver and bronze respectively. 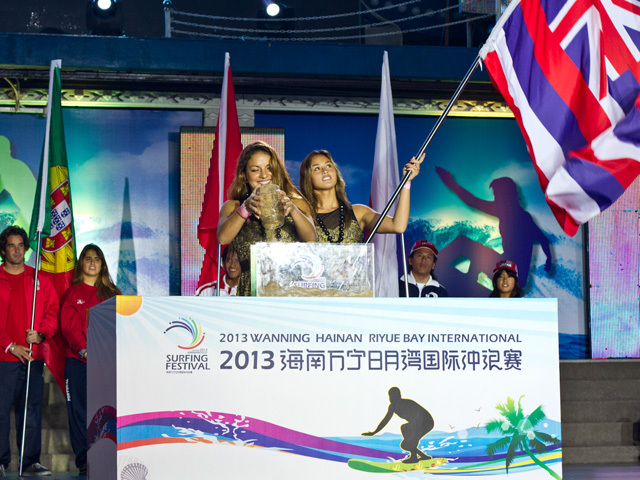 For women’s short-board surfing, Philippa Anderson from Australia won the champion with Alessa Quizon from Hawaii, Nicola Van Dijk from Australia finishing second and third respectively. For men’s surfing, Brazilian Michael Rodrigues got first with the top 17 points, leaving behind Mitchel Crews and Connor O’Leary from Australia. "The world’s best surfers showed they can perform at a very high level even in challenging surfing conditions," said ISA President Fernando Aguerre. "It was amazing to see a large crowd of Chinese locals on the beach watching the competition and enjoying the experience of being close to all the teams." The two-day event from Jan. 26 to 27 has attracted men and women’s surfing teams from eight countries or regions, including Australia, Japan, Peru, France and Brazil. With a lot of world-known bays such as Shimei Bay, Riyue Bay and Nanyan Bay, Wanning hosted the international surfing festival for the first time in 2010, and surfing has become an international card for the city.